Kerosene gets it name from the Greek word Keros (meaning wax). Petroleum, related to the production of Kerosene, was discovered in Pennsylvania in the mid-1800s and helped fund a number of American industrial fortunes. Oil for the home lamps had a new source. Kerosene was cheap and burned brightly. Lamp development was quick and kerosene lamps were one of the primary light sources in homes during the second half of the 19th century. The Student Lamp (not used widely in America until late 1870s) was a special type of lamp. Rather than the static construction of most lamps, a student lamp was based off of a ‘stem’ and the actual light could be ‘swung out’ or positioned over a book or paper that needed illumination. In our modern world, light sources cast WIDE beams and can make a room bright and cheery. The Victorians had a different experience. When writing your stories.. keep in mind where the light sources are. When you’re in a room at night or in the center of a house where there are no windows, where is the light? How much light comes from each source? How does that change where people stand in a room? How does it change their activities in the dark hours of the day? Or, if a character lacks the funds or access to such conveniences… do they go to sleep with the sun or find alternative methods of producing light? Since this is the winter, hopefully of much content for all of you… I wanted to post about Victorian Era entertainments and crafts. Hoping that if you do end up with some ‘snow days’ you might have something to occupy your time in a Steampunk way! FOX and GEESE. – There must be an even number of players in this game, and a circle is to be formed standing two by two, so that those who are on the outside have each one person in front of them; these are called the Geese, and there must be some space left between the couples, to allow the one who is chased to run in and out of the circle. Two must be left out, one a Goose, and the other the Fox. The Fox is to catch the Goose not belonging to the circle, who can run around the circle and also within it, which the Fox cannot be allowed to do; but when the Goose, who is pursued, places himself before one of the couples composing the circle, there will necessarily be three in the row, and as this is against the rule, the outside one of that three immediately becomes liable to be caught instead of the other, and must endeavor to avoid the pursuit of the Fox by darting within the circle and placing himself before some one of the players. It is the object of the Fox to catch the player who makes the third one of a row and it is the object of each Goose to avoid the third place. The Fox can only catch the Goose as he stands the third in a row, or before he succeeds in escaping to a place of safety. If the Goose is touched by the Fox while in the position of third one in a row, or if touched in passing from this third place to one of safety, he becomes the Fox instead, and the other becomes the Goose again. It will be observed that the amusement of this game will depend upon the spirit and animation with which it is conducted. Great rapidity of movement is necessary. While I was reading/typing out the instructions, it struck me that the game was still around when I was in school. Back then (in the 80s) we called it Safety Tag and played it in the school yard during PE Class. Would this game occupy children in the common room of an airship? In a village in a remote part of the world after a long voyage? Aboard a submarine to entertain the families of crew? What kinds of games would children in your stories play on long winter days/nights? I have some great friends.. old friends, but we won’t get into ‘how’ old… ’cause I’m NOT telling! Anywho, this old friend gave a beautiful necklace a long time ago made of paper beads. Recently as I was talking to him about this series of posts he brought up the beads. His grandmother had made them as a child and had learned the craft from her mother, so he knew it was from the ‘right’ era. A little searching on the net brings up a love link for those who would like to make the beads for themselves. But, if you’re a writer (and most of us are) why not make these beads with your printed drafts? Now, I know the concern may be someone opening up all the beads to read your work, but that’s a lot of unrolling… so don’t do it with your printed drafts if you’re worried, but I think it might be a nice way to recycle… or use those left over scrapbook papers! Alan D Lewis: I’ve written both and enjoy both. A novel gives you plenty of room to explore the characters and their worlds in my depth and detail. I prefer writing novels. On the other hand, short stories can tell a brief but compelling story, not weighing the reader down. For me, writing a few short stories after finishing up a draft of a novel is a pallet cleanser, so to speak. It’s hard to say, since I haven’t actually finished a novel to date. Wait. Maybe it’s not that hard. With Clockwork Demons in Capes & Clockwork, a very brief story in an upcoming werewolf anthology, and a novella from Pro Se Press, I suppose I’m really a short form writer. I enjoy exploring the economy of shorter works, and I think they support theme a lot better than novels. David J Fielding: Though I have aspirations at being a novelist, I find myself concentrating on short stories at the present time. There is a challenge to take readers on a journey, with a beginning, middle and end and keep it to a limited word count. Perhaps that’s the influence of modern media on storytellers – the on-demand format, the hyper-link generation – micro-bursts of entertainment; when they want it, how they want it. As a writer it challenges you to convey your ideas and story in a streamlined way. You find yourself creating shortcuts. There’s a Stephen King short story Mrs. Todd’s Shortcut that (for me) is a great metaphor of writing short stories – and that new roads, worlds and layers are out there. Christopher Valin: I haven’t written a novel yet, although I did write a history book. Most of my work has consisted of short stories, feature scripts, and teleplays. I grew up reading comic books and eventually worked in the comic business as an inker and writer, so I’ve always loved superheroes. Brent Nichols: I write frequently at a wide variety of lengths, from short stories to novellas to novels. Each form has its challenges and its rewards, and I’m fairly comfortable with all of them. Mostly, I like to tell a story, and I don’t worry too much about length. The story goes from the start to the finish, whether that’s four pages or four hundred. What aspects of the Steampunk genre do you find the most satisfying? Alan D Lewis: With Steampunk, I’ve always been drawn to the Victorian Era and the spirit of adventure and wonder. It was a time where anyone with some know-how could take a box of metal cogs and springs and invent wondrous contraptions. Balloons and airship were indeed flying during this time. Maybe not monstrous flying machines, but they did exist and were built by individuals, not by aerospace corporations. So Steampunk let my imagination run wild with what ‘could have been’. And superheroes? Well as a kid, I grew up reading The Avengers, Thor, and others. So writing about them wasn’t a problem but joy. Logan L Masterson: The best thing about steampunk is the opportunity of exploration. The Victorian era was a brilliant time, and its settings allow authors to as some great what if questions. That there remained so many unknowns opens the field. We can explore social issues, the resurgence of mysticism, technology, and wide, vast dominions, all with the same breath. Christopher Valin: As for Steampunk, it’s something I liked for many years without knowing it was a genre. For example, as a kid, ‘Wild, Wild West’ was one of my favorite shows. But it wasn’t until six or seven years ago that I realized it was a genre in itself, and started not only reading it, but writing stories in that vein. So being able to write a story combining the two and figuring out how to make it work was very satisfying to me. I loved thinking about how superheroes would have been over a hundred years ago. Brent Nichols: The beauty of Steampunk for me is the absence of limits in certain key areas. I grew up reading science fiction and old-fashioned adventure stories, and steampunk at its best combines the two. The thing about Steampunk technology is that it feels accessible. You can’t take apart a piece of modern technology and tinker with it. Pull the cover off of your smart phone some time and see how far you get. So much of modern technology is simply beyond the grasp of an individual. Most science fiction these days doesn’t involve a solitary genius making a breakthrough or building an innovative new machine. That sort of thing is done by the huge R&D departments of major corporations these days, not one smart person with a lab in his basement. In the 19th century, though, we had men like Edison and Tesla, and a few women, too, making truly astonishing discoveries and building devices that changed the world. Steampunk technology often feels like something you could create on your own, or at least take apart and tinker with, and understand. It’s just plain more fun than modern science fiction. The other part of Steampunk that appeals to me is the ability to play in a wild, fascinating past world, when every corner of the planet was not yet mapped and measured, when there were still lost tribes and unexplored jungles and so many things that were simply unknown. A steampunk writer gets to play in that marvellous world, without the need to be limited by actual history. Steampunk worlds are alternate worlds, and we get to make changes. We get to say, let’s change that historical fact, or devise that gadget that would not, strictly speaking, actually work. Let’s keep the story rooted in history and technology that are basically sound and feel plausible, but let’s allow for wondrous machines and places and events, because it allows us to tell such awesome stories. What writing challenges have you learned to overcome? Alan D Lewis: When I first started writing, my main problem wasn’t with developing the story or plot or characters. It was with the mechanics of writing. The subject had never been a strong point in school and I struggled, early on with that fact. Storytelling always came easy. Writing did not. But I surrounded myself with other writers who weren’t afraid to point out my errors and encourage me to continue. I also had to get over the fact that it doesn’t have to be right the first time. A writer can edit and rewrite and rewrites some more. My first book was a long, long road, but I learned enough that the second novel took a fraction of the time to turn around from an idea to a published manuscript. 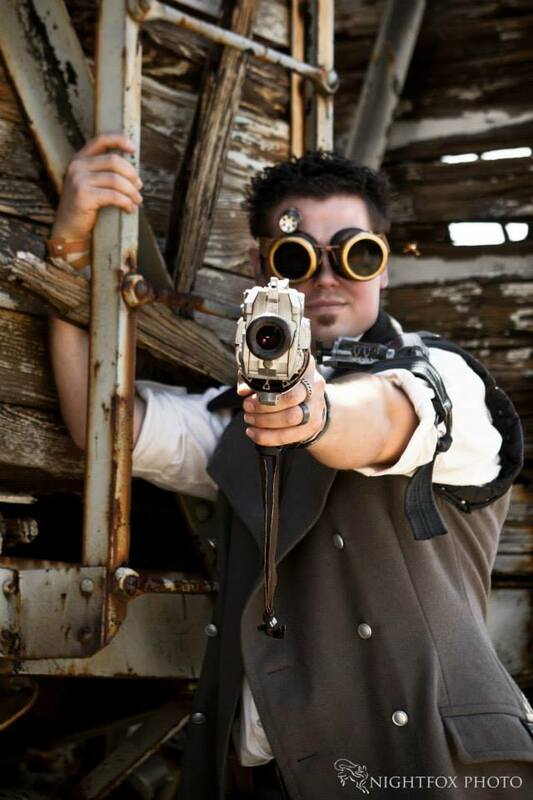 Logan L Masterson: Steampunk’s challenges are relatively few for me. It’s really a natural genre, since I grew up reading mostly comic books and, you guessed it, classics. Jules Verne, Charles Dickens, Thomas Hardy, and so many others. I was a teenager before I got past Tolkien into other “modern” fantasists, so the fusion of science fiction and Victoriana was easy for me. Add my love of comic books, and Clockwork Demons may have been the easiest story I’ve ever written. The only challenge for me was devising a unique, distinctive technology for my world. Once I had that wound up (hah! ), the rest fell into place. Christopher Valin: For several years, I wrote almost nothing by screenplays, so the biggest challenge for me in writing short stories is probably changing my mindset and including more description and inner dialogue. I’m still hesitant to include too much about how everything looks because I want to leave some of it to the ‘director’… which, in this case, is the reader picturing the story in his or her head. Brent Nichols: Learning to tie my shoes was a big hurdle. More recently, I’ve been struggling with how to present the technology of steampunk in a way that’s plausible and interesting without bogging the reader down in a lot of technical detail. The big problem with Steampunk technology is that most of it wouldn’t actually work. There were no airships in the Victorian era, no walking machines, no hydraulic spiders or steam-powered giant mechanical ants. Steam power requires vast weights of iron and water to function. The really cool inventions that steampunk writers and artists dream up simply wouldn’t work in the real world. I deal with it by dreaming up gadgets that are just a little bit beyond the realms of physics as we know it. Far enough out there to be cool, but not far enough out there to be ridiculous. And I hint at alternate-reality technologies, things that, if they had existed, would have opened the doors of possibility and allowed the fantastic gadgets of steampunk to be real. Enhanced coal, for example. My fictional enhanced coal burns hotter and faster than real coal and makes some preposterous machines just a little more plausible.